Akita Originating in Japan as a hunting dog, this is a large, powerful breed. Devoted to their family, they do best as the only animal in the household. Daily exercise and patient, early training are necessary. An excellent watchdog and an all around versatile breed. Alaskan Malamute Named after the native Inuit tribe, Mahlemuts, they were bred as Arctic sled dogs. An athletic and large dog that needs plenty of daily exercise. Intelligent and affectionate, they can be excellent family companions especially when given early training. 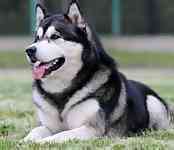 more information on Alaskan Malamutes. Anatolian Shepherd Dog Powerful and rugged, this is an ancient breed, developed in Turkey to protect livestock. Intelligent and alert, they are natural guardians. Daily exercise is essential. They are devoted to, and protective of their families. more information on Anatolian Shepherd Dogs. Bernese Mountain Dog Also known as Berners, these Swiss dogs have a beautiful tri-colored silky and long coat. Bred as working farm dogs, they are gentle in nature, and with children. Daily exercise is required as is frequent brushing of their coat. An excellent family companion that gets along well with everyone and everything in the household. more information on Bernese Mountain Dog. 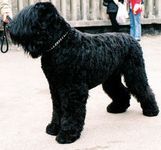 Black Russian Terrier Bred in Russia as a guard dog, this is a large and powerful breed. Intelligent and trainable, they can be excellent family companions. Their coal black coat is distinctive. This is a calm and courageous dog that needs daily exercise. more information on Black Russian Terriers. Boxer One of the main desires of the Boxer is human companionship. This popular breed is medium in size, well muscled with clean lines. They need daily exercise and minimal coat care. Their playfulness and energy make them good companions for active families. Bullmastiff Bred as a guardian for vast English estates, this is a relatively docile and quiet breed. Large and powerful in build, intelligent and willing to please in spirit. Makes an excellent family companion in a loving home and should be allowed to live indoors with a nice, soft bed. Cane Corso An ancient breed, they are intelligent and athletic. Also known as the Italian Mastiff, this is a medium large dog that was bred as a guardian and protector of people and property. They are excellent family companions and loving and docile with all members of the home. more information on the Cane Corso. Doberman Pinscher Elegant and streamlined in appearance, they were originally bred as guardians and companions. This is a highly intelligent breed that is easily trainable. They should be neither vicious nor shy. Requiring daily physical exercise and mental challenges, they are good family companions. 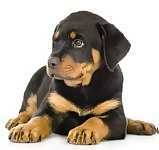 more information on Doberman Pinschers. Dogue de Bordeaux An ancient breed of France, this is a large and powerful dog, weighing close to 100 pounds. Also known as a French Mastiff, their massive head is imposing but this is an innately non-aggressive breed. An excellent, affectionate family companion for those having previous dog ownership responsibilities. more information on the Dogue de Bordeaux. German Pinscher Originally bred to hunt vermin, this is a high energy breed with an elegant appearance. They benefit from firm but gentle training and will become the center of the family's attention. Requiring minimal coat care and daily exercise, they are able to live in the city or the country. more information on German Pinschers. Giant Schnauzer This highly intelligent breed has had many roles in its working dog history. They look like a larger form of the Standard Schnauzer and are not technically a giant breed of dog. Needing quite a bit of daily exercise, and regular coat care, they are loving, family companions and guardians. more information on Giant Schnauzers. Great Dane This powerful yet sensitive breed was originally developed in Germany to hunt big game. Elegant in appearance, they are an extremely large dog. They are a great family companion, and require daily exercise and should live indoors with their family and have a very large, yet soft, bed. more information on Great Danes. Great Pyrenees Originally bred to guard sheep, this member of the AKC Working Group still retains these instincts. A large and imposing breed, they require daily vigorous exercise and love to work. Affectionate with their family, they are also independent thinkers and require a secure and patient owner. more information on the Great Pyrenees. Greater Swiss Mountain Dog Also known as Swissies, they originated in Switzerland, and were bred as draft and farm workers. This is a large and gentle breed, requiring human companionship. They love to work and to play outside in the cold weather. Daily exercise is a must except in hot weather, where they can become overheated. They are a devoted family companion. Komondor Originating in Hungary as a guardian of flocks, they are distinctive in appearance with their coat of heavy white cords, resembling a mop. Dignified and courageous, they were bred to work on their own, which means they can be stubborn in a non-working environment. Requiring daily exercise and probably needing professional coat grooming, they are a loyal and affectionate family companion. 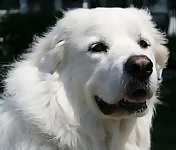 Kuvasz A large member of the AKC Working Group, they are outstanding livestock guardians. Their all white coat is a breed trademark although it is easy to maintain. This is a devoted companion and protective of its family. Slow to mature, they require early and patient training. more information on the Kuvasz. Leonberger Also known as Leos, this breed originated in Leonbery, Germany. A very large breed, they are extremely graceful. Outstanding family companions, who have a particular affinity for playful children. They require daily exercise and early and patient training. more information on the Leonberger. Mastiff Also known as the English Mastiff, this is an ancient breed originally bred as a watchdog. One of the largest breeds of dog, they have an air of dignity about them. They are good-natured, loyal and gentle. Daily exercise and plenty of room are required to keep this breed happy. They prefer mild to cool weather and should live indoors with their family. more information on the Mastiff. Neapolitan Mastiff An ancient breed that is best described as massive. Their large heads with abundant loose skin are imposing, although this is a relatively calm dog that is very devoted to his family and space. Neos are best owned by those with previous dog ownership experience, plenty of space, and people who do not mind drool! more information on the Neapolitan Mastiff. Newfoundland Also known as Newfs or Newfies, this is a popular giant dog breed. An avid and powerful swimmer, their coats protect them from cold water. Their disposition is extremely sweet and loving. They are excellent family companions and protectors that require daily exercise and plenty of space indoors. more information on the Newfoundland. Portuguese Water Dog Native to Portugal, this breed is well known for its outstanding ability to swim and dive. This is an intelligent dog with a great sense of fun. A loving and devoted family member that requires daily vigorous exercise. Its coat is hypoallergenic but requires maintenance. more information on Portuguese Water Dogs. 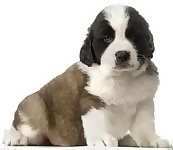 Saint Bernard Legendary for their rescue of travelers during snowstorms, this breed enjoys cold weather. Among the giant breeds of dogs, they are calm and gentle. Their coat comes in two varieties, long hair and short hair. Both types require regular grooming. Samoyed An ancient breed of Siberia, these dogs were bred as all-around working dogs. Intelligent and energetic, they have a characteristic "smile". Excellent family companions and playful with children. They require daily exercise and regular grooming. 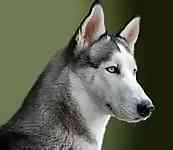 Siberian Husky This is an ancient Arctic breed of dog that has an extremely thick coat to handle very cold climates. Intelligent and willing to work, they exemplify power and endurance. Alert, playful and independent aptly describe their personalities. They require plenty of daily exercise and regular coat care. Standard Schnauzer Originating in Germany as a multi-purpose working dog, this is an intelligent and lively breed. Extremely affectionate with children and family members, requiring firm, yet gentle and patient owners. They require daily exercise and regular coat maintenance. The AKC Working Group dog breeds were all bred to perform specific tasks. The types of tasks varied, but included guarding and protecting, life saving, pulling, and water rescue. The breeds in this group share characteristics of intelligence and an ability to learn quickly. Most are large dogs with excellent strength. Many of these breeds are the happiest when performing their jobs or filling their days with activity. These working dogs need room to run everyday. Their size, strength, and innate nature to want to work, sum up the point that extensive training is recommended. Some of the most well known breeds and their inbred tasks include the Siberian Husky, bred to pull sleds; the Newfoundland, bred to help with water rescue and drafting, and the Great Dane, originally bred to hunt boar. The Cane Corso is one of two newly admitted AKC Working Group breeds. Of Italian descent, they are excellent guardians of property, and are loving devoted family members. The other is the Leonberger, of German descent. This calm, gentle dog is a perfect family companion, and makes a wonderful therapy dog. This breed directory page features dog breeds that are members of the AKC Working Group.